When I was a kid, photos were taken on actual film, which had to be sent out to be developed and printed. We used to snap a picture and have no idea what it looked like for days or even weeks. Next came the era of digital cameras. We could see our photos instantly, but physically printed photos became less and less common. Now we are in the epoch of smartphones and social media. Pictures are instantly viewable and instantly shareable, but physical prints are still somewhat uncommon. So even though your photos can be seen across the globe in a matter of seconds, you don’t have anything to frame and hang up on your wall. If you are looking for instantly viewable and instantly printable photos, I have got good news for you! Portable photo printers have been hitting the market hard. They are reasonably priced, easy to use, and small enough to throw in your luggage or backpack. If you want to put a picture on Instagram and then moments later, hold that same picture in your hands, you can do that with one of the following products. Welcome to the future of instant photography. This photo printer is tiny and is perfect for anyone looking to immediately print their cheeky smartphone pictures. The printer connects to your phone via Bluetooth. Through the HP Sprocket App, you can decorate your snapshots with doodles and filters, then print 2”x3” copies on sticky-back paper. 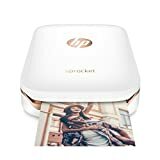 These prints make great souvenirs, so you can easily set up this printer at a party or event and let everyone connect via Bluetooth and leave with stickers of their own photos! The tiny printer can only hold 10 sheets of sticky-back photo paper at a time, so make sure to stock extra for re-loading and you are good to go. This printer couldn’t be easier to use. Pick one up now and remember how fun it is to have physical prints of your favorite moments. 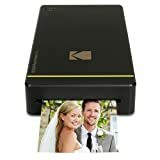 If you are looking for photos that will fit into standard frames and scrapbooks, then this option from Kodak is a good one for you! 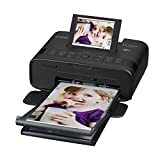 This printer has so many ways to connect – you can dock your phone right on top of it to load your photos directly, print photos through a USB stick or digital camera, or even send photos from your phone to the printer via Wi-Fi. If you choose to dock your phone, the printer will even charge it for you while you wait for your photos to print! It has a unique, 4-pass tech which means you can watch your own photos print 4 layers at a time, adding more color to the image each time. This printer even comes with the associated Kodak Photo Printer app, which allows you to decorate your pictures before printing. If you have got some empty frames sitting around your house and hundreds of photos stuck on your phone, then this is the perfect option for you. This printer is roughly the size of a standard smartphone. It prints 2.1” x 3.4” photos directly from your smartphone, via the Kodak Photo Printer App and Wi-Fi. If you have an android phone, you can place your phone directly on top of the printer for a direct connection. Seriously, it only takes one tap to print. If you have an iPhone, you can connect via Wi-Fi. This printer utilizes the 4-pass print technology. This means you can watch your photo print by layers, adding more color and detail each time. Cartridge replacement is as easy as removing the empty one and snapping the new one into place. You can purchase cartridges of regular photo paper or stick-backed photo paper. It is crazy easy to use. This is a great printer to set up at parties. This is great if you’re looking for something more robust with more options. The printer itself is a bit larger. But with that heft comes the options to immediately print 4” x 6” photos, 2.1” x 2.1” square photos, or even 2” x 6” photo booth layout prints. You can print directly from the Canon PRINT app, or through a hardwired USB connection. The printer comes with a built-in LCD screen, so you can see what you are about to print. With their innovative Party Shuffle mode, multiple people can send images from their phone to the printer. They can even collage them before sending to print. The printer can take regular or stick-back photo paper, and the paper itself is water resistant. The next time you take the perfect photo, don’t lament the fact that it will be lost in a cyber collection of hundreds of others like it. Instead, print your pic instantly and ensure that your loved ones will never forget their fondest memories! After all, photos make great decorations for your home, fantastic gifts, and can be the personal touch that a card or a letter is missing.